Lawry's Creamed Spinach - Served at Lawry's Prime Rib Restaurant in Beverly Hills. 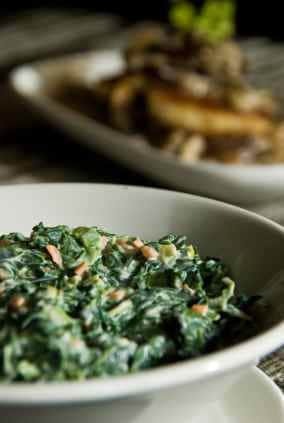 Home » Casserole Recipes » Lawry’s Creamed Spinach – Served at Lawry’s Prime Rib Restaurant in Beverly Hills. Lawry’s Creamed Spinach – Served at Lawry’s Prime Rib Restaurant in Beverly Hills. Served at Lawry’s Prime Rib Restaurant in Beverly Hills. It is easiest to snip the bacon when it is really cold from the refrigerator. I use the microwave to warm the milk. A favorite of our family at Christmas. This creamed spinach is served at Lawry’s Prime Rib Restaurant in Beverly Hills. Cook spinach according to package directions and drain well. Snip the bacon into tiny bits with scissors. Fry the bacon bits until crisp, set aside and remove most of the bacon drippings from the pan. Saute the onion in the pan drippings until very tender, about 10 minutes. Add the bacon bits back to the onion mixture for the last couple of minutes of cooking. Remove onion/bacon mixture from heat and stir in flour, seasoned salt and pepper and garlic (it will be a thick paste roux). Blend thoroughly. Add the warmed milk all at once. Return to medium heat and stir until smooth and thickened. Add spinach and mix thoroughly. Keep warm until ready to serve. Can u make the cream spinach a day ahead and warm it on Christmas? I did. I warmed it in the oven. I added a little more milk to smooth it back out. Thanks for letting us know how it was when you cooked it the next day.